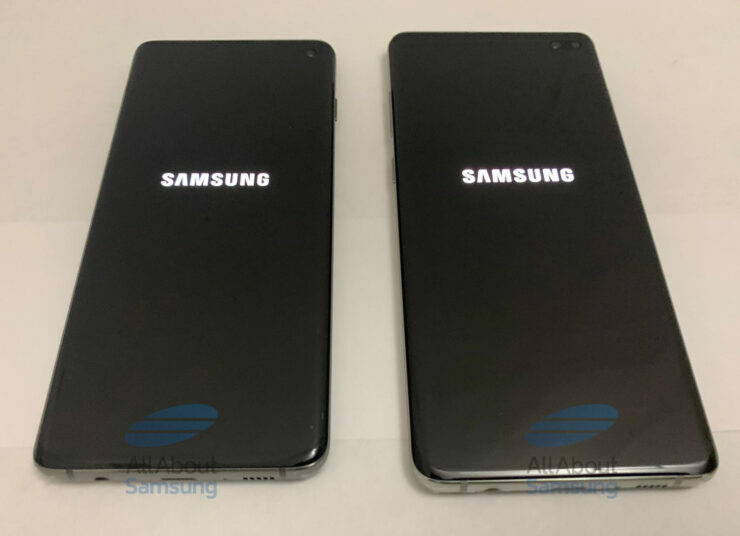 Galaxy S10 And S10 Plus Leak In Seven Live Images With Thick Bezels! With their launch less than a month away, the floodgates have opened for the Galaxy S10 lineup’s leaks. As Samsung finishes its pre-launch preparations, and units of the smartphone start to move around the world, the probability of leaks starts to go up. 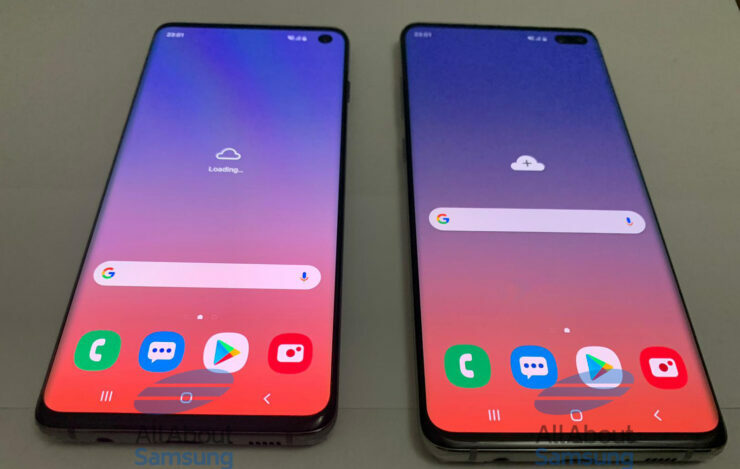 Now, after a leak that displayed the Galaxy S10 running Samsung’s cryptocurrency application, we’ve got seven live images of the Galaxy S10 lineup. Take a look below for more details. Before we get to the images, it’s relevant to note that the S10 smartphones will feature a brand new display design and horizontal rear camera setups. 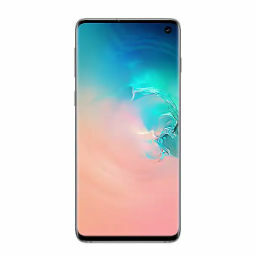 Samsung will equip the pair with its Infinity-O display panels, and the company will also keep up with Huawei by offering the larger Galaxy S10 Plus with a triple rear camera setup. Additionally, the Korean tech giant will also keep the 3.5mm earphone jack on its smartphones. 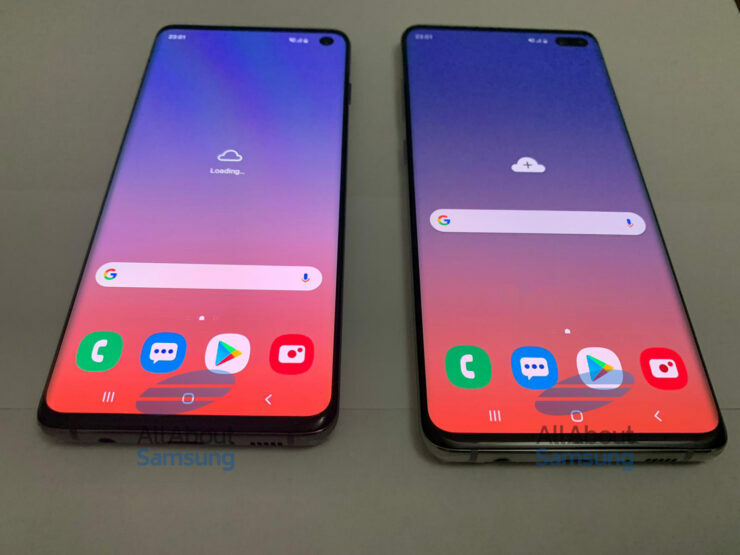 Today’s leak highlights all these features and displays how the finished S10 will look. It’s from the Dutch publication AllAboutSamsung, who have a good track record of obtaining such information. The images show a dual front camera setup for the Galaxy S10 Plus and a single front camera for the S10. They also show a 3.5mm earphone jack at the bottom of both the smartphones. Additionally, if the images are authentic, then we can also confirm that the Galaxy S10 Plus will feature a triple rear camera setup while the S10 will feature a dual camera setup. Samsung is also rumored to launch a 5G capable tenth-anniversary Galaxy S10 smartphone with four rear cameras, but we are yet to see any evidence for this device come to light. 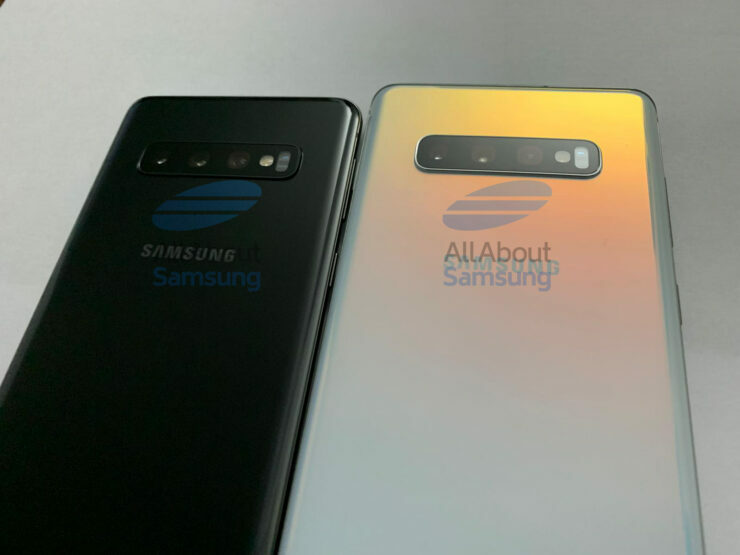 Moving towards the S10 and S10 Plus’ design, the pair’s antenna bands will be present on their bottom and we’ve also got what looks like an interesting gradient finish for the Galaxy S10 Plus’ back. 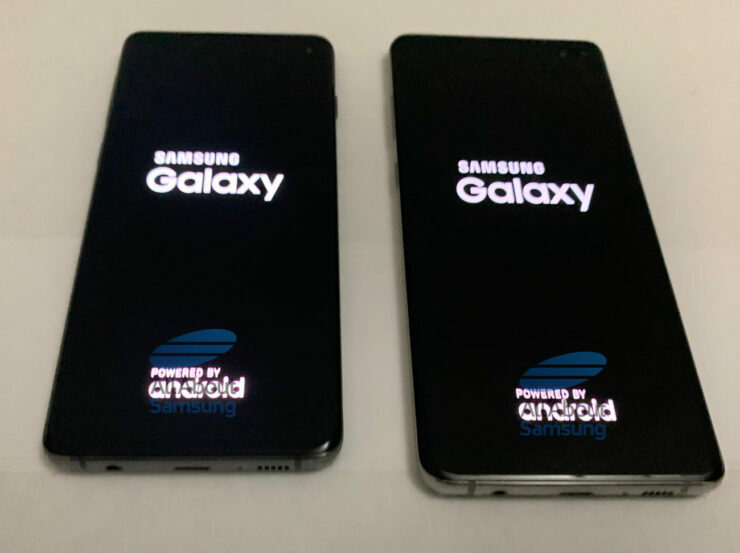 AllAboutSamsung goes on to add that the boot logo for these gadgets will change as they are not the final variants of the S10 smartphones. 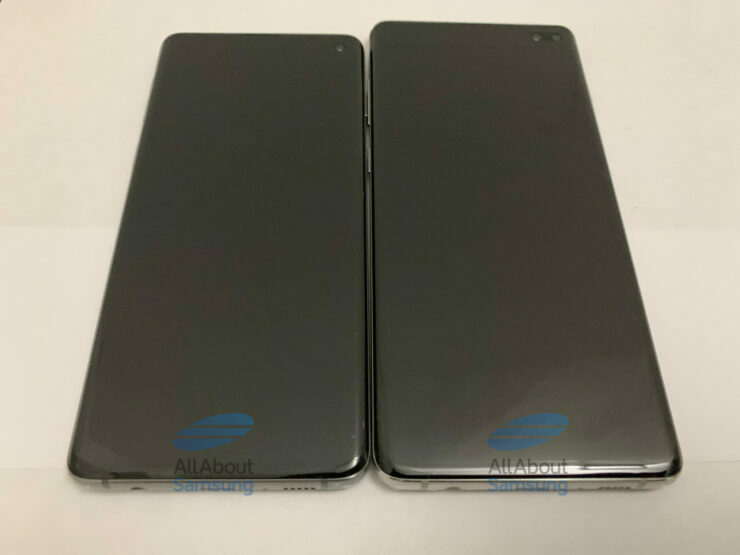 Finally, if you look closely at the front of the two smartphones side by side, you’ll notice that the S10 has a larger chin than the S10 Plus. Samsung has also retained the Bixby button, which appears on the left of the smartphones below the volume rocker. 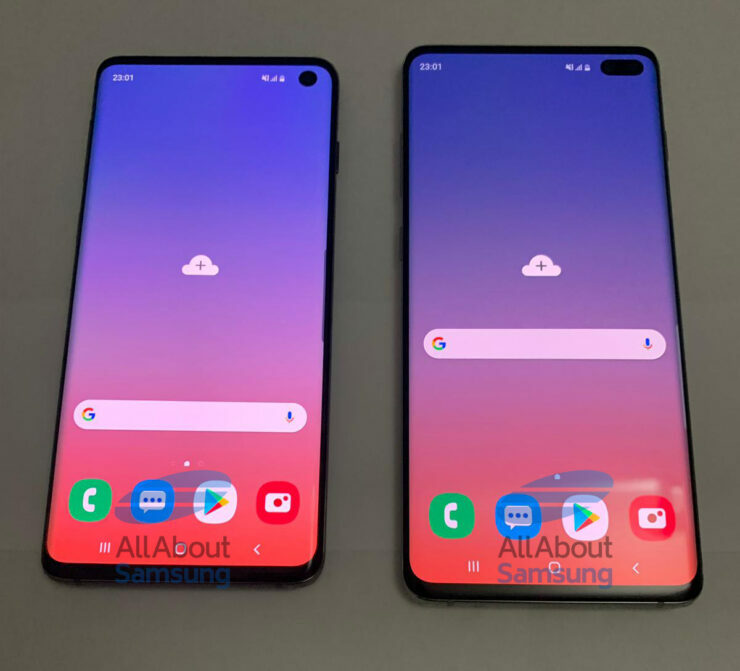 All in all, the S10 smartphones resemble earlier leaks but appear to have thick screen borders.